Our planting guide for the South West Slopes of NSW is here to help. It covers Albury and surrounds, up into the Upper Murray. 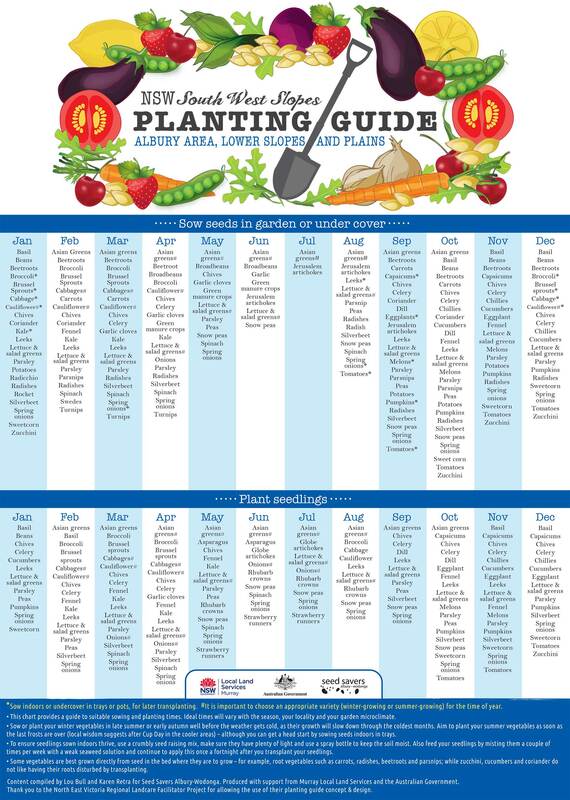 The guide provides advice for sowing both seeds and seedlings across the year. It’s tailored to local conditions and based on our collective experience. Created by Seed Savers Albury-Wodonga with support from Murray Local Land Services and the Australian government. And a huge thank you to the North East Landcare Regional Faciliator Project for allowing the use of their planting guide concept and design. Get your A3 copy next time you come along to a Seed Savers Albury-Wodonga event, or from the Murray LLS offices in Swift St, Albury. (It’s 4MB – so it might take a while to load). This entry was posted in Growing advice and tagged homegrown, planting, seeds by Seed Savers Albury-Wodonga. Bookmark the permalink.